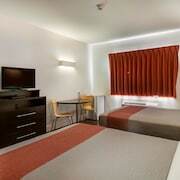 Where to find Riverview hotels near an airport? Where can I find hotels in Riverview that are near tourist attractions? 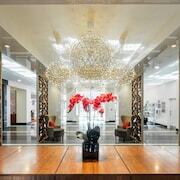 If you are on the lookout for great places to stay in Riverview, you've got plenty of options. Expedia's comprehensive database lists 35 places to base yourself within a 0.1-kilometre (0.06-mile) radius of downtown Riverview. Hotels in easy walking distance of the center of Riverview, are the Econo Lodge Moncton and GoMotel.ca. You could check out the St. James Gate or the Residence Inn by Marriott Moncton. The St. James Gate is positioned 4 kilometres (3 miles) away from the heart of Riverview. 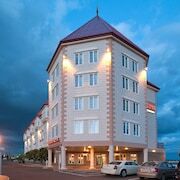 The Residence Inn by Marriott Moncton, is located 4 kilometres (3 miles) away. 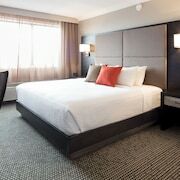 The Delta Hotels by Marriott Beausejour and the Hampton Inn & Suites by Hilton Moncton are some other Expedia-listed accommodations around Riverview. Spend some time enjoying Parlee Beach Provincial Park and South Cove Camping and Golf, which you'll find in Shediac, 25 kilometres (17 miles) to the northeast of Riverview. Expedia-listed Shediac accommodation options are the Seely's Motel and L'Auberge Gabrièle Inn. 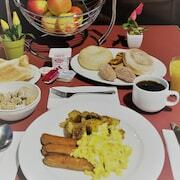 6 kilometres (4 miles) to the northeast of Riverview, is Dieppe, which is home to the Holiday Inn Express Hotel & Suites Airport Dieppe and Chateau Moncton & Suites, an Ascend Hotel Collection Member. While visiting Dieppe, be sure to explore the Champlain Place Mall and Fox Creek Golf Club. Just because you're far from home, doesn't mean you can't enjoy your love of sport. Moncton Coliseum is situated 5 kilometres (3 miles) to the northwest of Riverview. 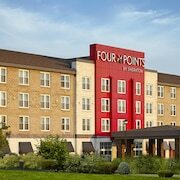 Sleep nearby to the action at the Four Points by Sheraton Moncton or the Travelodge Suites Moncton. Greater Moncton International Airport is a logical airport, and is located 11 kilometres (7 miles) from Riverview. 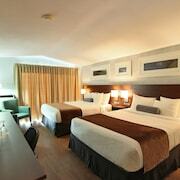 Nearby accommodation options include Fairfield Inn & Suites Moncton and Quality Inn Airport. What are the most popular Riverview hotels? Are there hotels in other cities near Riverview? What other types of accommodations are available in Riverview? Explore Riverview with Expedia.ca’s Travel Guides to find the best flights, cars, holiday packages and more!